Jerry Nixon on Windows: 15 Easy Ways to Screw Up Your Next User Group Talk. And, a little advice. In college, a millennia ago, I spent a summer serving Philadelphia’s inner city children with Bart Campolo. As a leader, he was an effervescent, tireless motivator; an excellent writer as much a speaker. As he verbalized his process he forever transformed my approach to public communication. He explained two reasons for communication. The first, information. This practical, utilitarian task comes up from time to time, but isn’t the reason the world needs excellent communicators. It simply set a level across participants. If you were successful, people knew more. It’s as simple as that. The second reason for communication was to motivate. The task was always preceded with one key question, “What do I want my audience to change?” Information and passion were mixed for an audience-specific recipe. If you were successful, people did something. Both types of communication are important. Of course. Sometimes information alone is sufficient for the task. But when you sieve out the better communicators, you find that incessant tendency toward motivation and inspiration toward action and change. Consider the importance and power of passion? Passion alone is almost enough. Yeah, I said it. But how can anyone be passionate about mere information? They can’t. It isn’t sustainable. What creates passion is when a speaker or leader can feel the influence of their work on people they genuinely care about. I believe we all want to be excellent communicators. Recognizing excellent communication qualities creates a roadmap for us to be better. One stepping stone toward this is motivating change over mere information. Asking ourselves, “What do I want my audience to change?” Let’s look closer. Windows Azure is Microsoft’s cloud service for storage, delivery and computing. It is a vast array of services that, when combined, create an equally vast array of potential solutions. If I were to ask you to “present on Azure”, you have many ways to approach the task. Let me start by acknowledging that presenting technology is not easy. We ask our developers, sales people, community leaders, and influencers to do it. And yet, we rarely give them the guidance we need to do it successfully. As a result, we see limited success. Consider some communication first principles: 1) Command the topic – when a presenter knows his stuff, people listen. 2) Preparation – when a presenter comes prepared, people listen. 3) Communication – when a presenter is an excellent communicator, people listen. 4) Relevance – when a presenter relates the topic to the audience, people listen. When those aren’t true, people don’t listen. 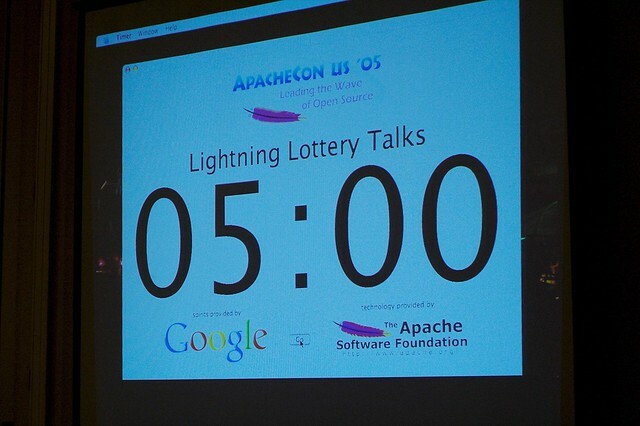 Lightning talks are short, discrete talks – usually 10 minutes. They are the quintessential “necessity is the mother of invention”. When communities can’t find speakers, they launch lightning talks. Non-speakers and non-communicators are drafted to a wanton and unlikely list of would-be presenters. The salve for lightning talks is that they unearth latent communicators. Sometimes. The reality of lightning talks is that speakers 1) don’t command the topic, 2) don’t come prepared, 3) aren’t good communicators, and 4) aren’t given time to relate a topic to an audience. Perhaps as a social science experiment, lightning talks are an interesting structure. But when you step back and look at the strategic purpose for excellence in communication, lightning talks are a fundamental anti-pattern that fosters bad behavior, rarely bringing qualitative change. On the other hand, breaking up a single topic into multiple speakers can be successful. This might feel like lightning talks, it’s not. Introducing new voices can reinvigorate your audience’s attention. One speaker may reach a different segment. But, without a unified message, success is only tenuous. Feature stream is the go-to style for most presenters. It vomits a bucket of features and specifications onto an audience. Azure can do this and that and this and even that and this, too. By the end an audience knows there is a lot, but they likely can’t remember more than one or two. This approach is good if you hate your audience. It rarely solicits questions, because you are talking fast to get through your large slide deck. Your glazed over audience’s ovation is a combination of startling them awake and rejoicing that you are finally getting off the freaking stage. To be honest, there is a scenario where this is valuable. Sometimes, your audience is extremely versed in the subject. A machine gun approach doesn’t confuse them, just refreshes them or introduces them to research topics. But why? This is such a far-out edge case, I wish I hadn’t mentioned it. Just ask yourself “Why am I giving this presentation?” If you hate your audience or the topic, you’ve found the correct weapon. If your manager is forcing you to present, again, you’ve found an agonizing approach. But if you want to communicate, you’re close – just not close enough. In the case of Windows Azure, feature stream results in 1) intimidation – your audience can’t imagine approaching something so vastly comprehensive, 2) misdirection – amid the ingested volume of words, they have concluded X when you were communicating Y, or 3) fear – the tech appears so interlocked they conclude it is brittle, not robust. They don’t apply it to themselves or their jobs. They just leave. Spoiler alert – this is an awesome approach! Asking an audience to remember the pain means identifying something that isn’t perfect, that doesn’t work, that has far too many workflow steps, or that’s plain broken or stupid. Most tech exists as a result of some customer pain point. Don’t introduce the tech, introduce the pain point. You will know when the audience remembers the pain. Some of the ways you will know are 1) they start to nod vigorously at your slides, 2) they start to chuckle at the scenarios you introduce – as they recognize them, or 3) or, honestly, they start to cheer in delight of not being the only ones to think it. Sales people understand this “painful” approach. In sales, you are often trained to identify the pain through listening. And, honestly, salespeople invent discomfort when the pain is otherwise insignificant. As a speaker you have nothing to sell but an idea. You don’t have to exaggerate to get buy-in. “We are all developers here. We love technology. And, we all have personal web sites; we all have playground web sites. There’s so much to learn, often too much to learn. We need a place to try out the latest thing. I get it. Go Daddy, 1&1, DiscountASP, we’re hosted all over the place – with varying support for different frameworks and the technologies we’re trying use. Each of us pays for a lot that we barely use and rarely like. We’re either getting first graders as support or first graders as admins. It just blows. We deserve better, and we don’t want to pay for it! What’s wrong with that? That approach speaks directly to developers before bringing up the technology. It doesn’t just identify the nuisance developers have, but the speaker’s voice turns into an advocate for the developer. It’s not selling to them, it’s complaining for them. It takes the audience toward mutual despair. And, then, when we’ve all agreed how terrible life is – it presents a solution. Remember the pain? Here’s the solution. the audience will be itching to watch your demo. This is a powerful approach to change the behavior of your audience. Let’s be honest – we’ve all experienced this approach on infomercials. They spend buckets of money to be effective. And, they make buckets of money because they are effective. It works and it’s awesome. I was asked to speak and I can’t say no. I want to demonstrate my knowledge. I want to share something with others. I want to build my reputation. I love to be up front. None of those are wrong answers. And, sometimes we blend more than one answer. That’s okay, too. But, if your reason is basically “you” then you can choose the feature stream. If your reason is basically “audience” then you drive yourself toward “pain relief.” It’s harder to prepare, harder to present, but in the end – it’s the only path to present real value to a captive audience. It’s important for you to realize that when you turn your motivation to your audience, it automatically elevates you. People naturally are drawn toward and prefer developers that clearly prefer them. So, if you are motivated to help yourself – just turn your motivations around, and help your audience. It will make you unique, and inevitably more successful. I love virtual machines. How else can we show off so many technologies? Who can afford that many physical machines? But, if you can’t setup a virtual machine and make it stable; if your crappy laptop can’t run the virtual machine, then stop using VMs in presentations! I can’t stand it when a presenter says, “I am running a VM here, so forgive me if I waste your time with slow performance and likely failures”. You’re wasting all of our time, and it makes me hate you! If you need a VM to present, you might consider hosting your VM in the cloud. This can be super-inexpensive, and help drive your talk toward success. Remember to only try this if you know internet connectivity is good. I love beta technology. When presenters present beta technology, it saves me the heartache of learning it the hard way. But, if you can’t handle beta software or aren’t ready to present because you haven’t learned it enough, then stop using beta software in presentations! I can’t stand it when a presenter says, “I’m running beta software so who knows what will happen!” You know! You’ve prepared this, right?! You’re wasting all of our time, and it makes me hate you! If you need to use Beta to present, don’t apologize for it. The audience already understand. But plan for the worst. If you think that “one thing” might not work, screen capture the correct outcome for to show if yours fails. I love realistic examples. A realistic example lets me apply a speaker’s point to something I might actually do. Hello World is great, but something real can change my life. But, if your realistic example is so crazy-complex that it takes have your time to explain the scenario to the audience, then stop using realistic examples in your presentations! You’ve only got so much time! I hate it when presenters spend more time with their stupid sample scenario than the tech they are there to present. You’re wasting all of our time, and it makes me hate you! If you want a realistic example, just simplify it. There’s a difference between “true story” and “based on true events”. This isn’t a cross-examination, you can skip the details and get to the point you want to show. I love live demos. There are several modalities to learn, and watching someone do it is a powerful way to learn. But, if you are going to pick some million-dependency scenario that will likely fail or take forever to make a tiny point, then stop using live demos in your presentations! I can’t stand it when a presenter says, “The internet here is flaky so this might not work!” What? You didn’t think of that ahead of time? You’re wasting all of our time, and it makes me hate you! If you want a live demo, have a finished product ready to demo. If you can’t have a finished product, then have a finished screen shot. Assume your demo will fail. Just assume it! Now, what will you do? I love a company shill. When someone is fully bought-in to a technology they can really sell its value. Value, that otherwise, might be obscured. A third-party solution can save developers hours, weeks, even months of time – and deliver a better overall solution. But, as soon as your way is the only way. As soon as everyone else is an idiot, you’re the idiot – and you are insulting your audience. If you’re going to represent, fine – but acknowledge the other path. Otherwise, you’re just wasting all of our time, and it makes me hate you! If you are a company representative, then I get you. I’m a Microsoft Developer Evangelist, for Pete’s sake! But as soon as yours is the only answer, you’re in a world of hurt. It’s okay to believe. But you need to relate. If you want your presentation to fail, then I have assembled some easy solutions for you. You don’t have to work hard to be a loser when I’m here. Here are some of the top things I have used to ensure my talks aren’t successes. Don’t come prepared. If you want an easy way to screw up your talk, star here. Subjects are too complex to try to learn them thoroughly; do an internet search, find a pre-existing slide deck, you’re good to go. Don’t rehearse. The truth is, going over your talk for the first time in front of your audience is a great way to fail. Especially demos! Ignore the time. Ending early is great, and going long is even better. There’s no reason to honor the clock or your audience. Don’t do a tech check. If you’re short on content, which you probably are, burn as much time as you can connecting to the projector. Take everything offline. Questions are just ways for you to screw something up, when you get one, just “take that offline”. Belittle your topic. Don’t get attached to your talk. It’s probably not good, it’s probably not going to work. And, make sure you say that. Belittle your audience. You’re wasting your time. They’re not going to get it. This is complex. And, use the right body language to show it. Don’t be relevant. Talking to a bunch of web developers? Sound to me like it’s time to do more desktop demos. They should know better. Don’t be available. Neither show up early nor stay late. Interacting with your audience will just cause you to have to relate more. Don’t have an agenda. No clear goals, vague points, and no outcome expectations means your talk just got a whole lot easier. Stray from the script. Your demo might seem complex now, but how much more complex can it seem? You have things to learn, too! Try to be repetitive. Research your audience is tiresome. Who cares if they just heard a talk on the same topic. Yours will be better. Don’t use good hardware. Good hardware makes your demos too short. You have time to fill, and your Celeron is on your side. Max out your resolution. You’re most productive when you have more on your screen. Those idiots in the back get what they deserve. Blame everyone. It’s the hardware, the VM, the software, the internet connection. Everything is to blame. But, buddy, never you! You’re way to smart to read those as anything but sarcasm, right? Hopefully you aren’t trying to make your talk fail. But I can’t help but recognize how many speakers employ those devastating strategies to their talks. Successful talks are difficult, terrible talks are… easy. Use logical fallacies, just like Hitler! This starting to make sense? There is more to be said about this. But, this is the end of this article. If you are about to present something, consider your motivation. Is this for you or for them? And if this is for them, what do you want them to change – what behavior do you want to see different? If the answer is “nothing” then you are just wasting all of our time. You can be a great speaker. Start by looking at this article, and consider the qualities of other great speakers – especially their motivations.